There's nothing better than feeling confident in the clothes you wear. However, too many women lack confidence when it comes to their attire. This makes me sad. However, since I've got a fail-proof 8-step plan to improve every woman's dressing confidence-let's do it! In Thursday's Personal Profiles...8 (step-by-step) ways to interpret the seasonal trends age-appropriately. What woman doesn't want to look and feel age-amazing? TIP: Mix your dressy items with casual ones for casual-chic looks. 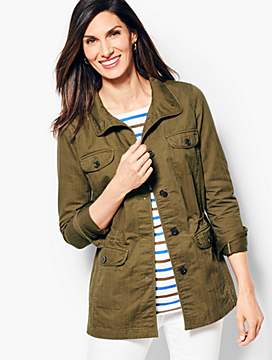 Psst...This casual jacket defines every woman's waist! Refining your style takes a leap of faith. You'll be putting yourself out there when you start trying new styles unfamiliar to you. However, the best part is, you'll be learning how to dress stylishly with confidence. Relax, you CAN do this! I'll be here with you, showing you all 8 steps. Get off the side lines! Jump right in...and refine your style! This week, grow your style skills with 8 incredible ideas you've never thought about before! It’s about becoming your own personal stylist. Rev-up your style creativity with this week's "8 Ways to Refine Your Style"! This week's Style Mission is to make a "Style File". You'll need a 3-ring binder and some clear page dividers to get started. (If you've already made one, set your timer and take 15 minutes to declutter/organize your current Style File). 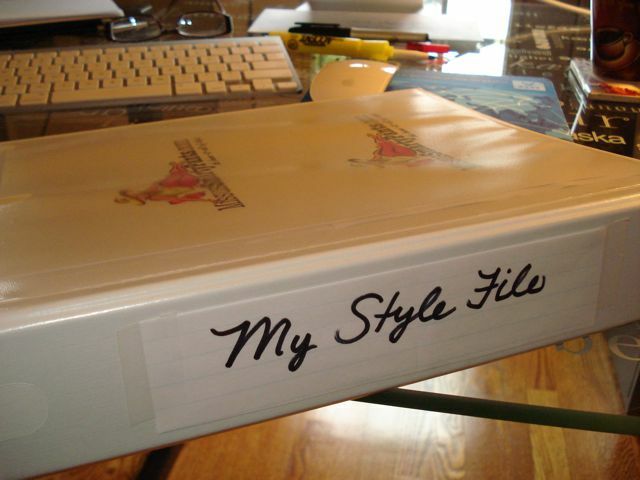 A "Style File" is a style control journal where you keep everything fashion/style related. Your Style File can be set up any way you like--but here are a couple of suggestions... Organize it into several sections. In one section, save the weekly MSP Style Articles (from the Personal Profiles) that you wish to keep for future reference. In another section, list outfits you have put together that have worked out well (this will come in handy when you are short on time). Yet in another section, tear out inspiring photos of outfits you love and anything fashion/accessory related that makes you smile. Having a Style File is a great way to help you figure out what styles and colors you like the most. You will see some type of pattern emerging from your clippings. You will have as a reference outfit ideas you wish to copy or color combinations you are going to try with your own wardrobe. Your Style File will be a collection of all things style related. It's YOUR control journal and can be a valuable tool for putting together some fabulous outfits! P.S. Don't forget, another fabulous tool to help improve your style is the "Style Recipes" eBook! With just 25 basic pieces you can create over 100 stylish outfits. With the "Style Recipes" eBook, you get the complete list of what to have and the template of how to create one stylish look after another! "Now, this is funny!" Who says husbands don't pay attention? Just thought I'd post a thought or two on the “I'm not the size I wanna be” mindset. I've been working for over a year on my weight. I've gone from a 38inch waist to a 34. So far I've lost over 45 lbs in the last year. It has been a moment by moment journey. One mouthful at a time…of course the fact that I've painfully discovered that if I eat certain things I'm in tremendous pain has been an incredible motivator. So I've learned to make healthier choices. Last night my daughter and I went to Cato. I've avoided "shopping" unless I absolutely had to. I found two pairs of the cutest leather shoes for $2.99 each. I've been looking to add wardrobe pieces that would compliment my body style. Having a specific type of clothing in mind and already knowing my color palette has changed the way I shop now. It's so much faster and less stressful. A year ago I didn't even feel like I had a style, let alone find something to compliment it. So for anyone debating whether or not its worth it to sign up for the Missus Smarty Pants emails.. my answer is yes... I'm worth it and so are you. I am a full time Mom with kids 13,12 and 10. I had not been looking my best… so I decided to try your service. The change has been an absolute revolution for me! I have not lost any substantial weight, but I have gotten more compliments than I ever did before kids. Weird, but delightful!! I didn’t even shop much as I went “closet shopping” and ended up just getting rid of a bunch of schlumpy sweats and baggy stuff that just made me look FAT. Now that I dress for my "E" figure, I just feel better-Thanks!! Could you please explain how to spot a good deal on clothes? I have a gift card and when I go shopping I get nervous that I may not wear what I buy. How do we know that we are making a smart purchase? By the way I love your weekly shopping guides in my personal profile! The pictures are so helpful to me and my “C” body type. I am ready to start shopping better! That is a good question! A bargain is NOT a bargain if you end up not wearing it! Think about the “cost per wear” before you buy. Some items will cost more than others. Divide the amount of times you wear it, by the price of the item. 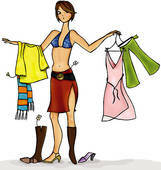 The Wardrobe Basics (in your Personal Profile) are clothes that will have a low “CPW” because you will wear them often. Other clothes, like a formal gown will have a high “CPW” because you may only wear it once or twice. I also recommend you think of at least 3 different ways (or more) you can incorporate your purchase in to your regular wardrobe —BEFORE you buy it. If you buy something because it is a “bargain” and you have nothing to match it—then you are only wasting your money! When you bring home your new purchase, don’t just hang it up in your closet! Instead, get creative and pull out other clothes and make more new outfits (including accessories). It takes time, but with MSP’s wardrobe plan and thoughtful purchases you will enjoy your wardrobe for a long time to come! What’s the best way to deal with static cling during the cold winter when the air is so dry? The best way to handle static cling is with believe it or not…is with good old water! Use water from a spray bottle (or wet your hands) to reduce the static charge that is produced by the tights, skirt and dry winter air.